But where can we buy them? my Costco…and the ones near me no longer carry them! I really miss them. Hi, Here in North Idaho they still carry them, so you should ask them to bring them back pronto. Do you have an address for Costco in North Idaho? I’ll hitchhike to Idaho if I have to. I just tasted these today, after my son received some in his trick-or-treat bucket. LOL I called around to the stores at the mall just to see who the 411 on this candy. After calling 5 stores, I learned it was a Costco product, so I will be calling them tomorrow and praying they are in stock. You are so right, they are DELISH! I hope you find them. There was a palette of them at my Costco 2 weeks ago. Holy cow those are delicious!!!! what is the calorie count? 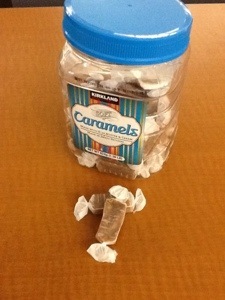 Nothing better than Kirkland Soft Caramels. For some reason, Costco store in Gilbert, Arizona, no longer carries them. Where can I purchase some? My Costco stocks them on and off. Make sure you ask for them at the front desk so they know that you’re a fan. thanks for reading! They do not seem to be available in Gilbert, Az, or any of the Phoenix area Costco. Any mail order sources ? Let me know if you have any success getting them. Thanks for visiting the blog! Thanks for the tip-off. However, Go Depot said that they cannot sell in Arizona. Where can I buy them. The Costco stores in metro Phoenix no longer carry them. Costco carries them from time to time. Ask the front desk when they will carry them again. thanks for visiting the blog! Any mail order outlets for the caramels ? Go Depot cannot sell in Arizona (for some reason). Thank you for the tip anyway. Where can I buy Kirkland Soft Caramels? World’s best, but I can’t get any.